Situated in the Promenade Shops at Orchard Valley, Hampton Inn & Suites Manteca offers rooms with free Wi-Fi and a flat-screen TV. Facilities include an outdoor pool and a gym. The air-conditioned rooms of Hampton Inn Manteca feature a modern interior, decorated with dark wooden furniture. All rooms have cable TV, tea and coffee making facilities, and a work desk. Every morning, guests can enjoy a hot buffet breakfast at Hampton Inn & Suites Manteca. A 24-hour Pavilion Pantry Market offering snacks and beverages is available as well. Hampton Inn & Suites Manteca’s reception is open 24/7. The hotel also offers laundry and dry cleaning facilities, fax and photocopying services, and baggage storage. The Manteca Historical Museum is just 2 miles from Hampton Inn & Suites Manteca, and Delicato Vineyards is 5 miles away. 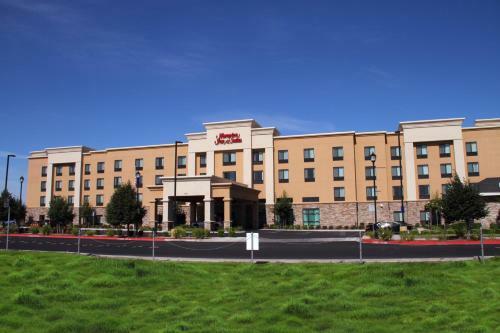 the hotel Hampton Inn & Suites Manteca so we can give you detailed rates for the rooms in the desired period.